This is the first in-depth study of the involvement of businessmen in the campaign for Tariff Reform, the most important and pervasive political debate on economic policy in the first three decades of the twentieth century. Previously published work on Tariff Reform has concentrated on its political or "social-imperialist" dimensions, and our knowledge of businessmen's motivations, objectives, and strategies has been under-developed. This book is organized around an analysis of the pressure and propaganda groups directed, or supposedly directed, by protectionist businessmen themselves. Detailed treatment of Joseph Chamberlain's Tariff Commission before the Great War, and of successor organizations such as the Empire Development Union and the Empire Industries Association, provide a thread of continuity from Chamberlain's Birmingham speech in 1903 to the Import Duties Act in 1932. Less overtly political bodies, such as the Federation of British Industries, the National Union of Manufacturers, and the chambers of commerce, are also studied. 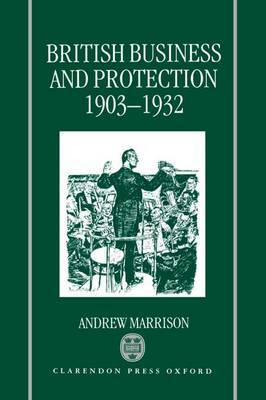 The book includes the first in-depth investigation into the development of protectionism during the First World War, and presents a new analysis of the turbulent events of 1929-1932. Andrew Marrison gives particular attention to the questions of economic motivation and industry-alignment - areas where oversimplification and generalization have been common - and to the relationship between business participants and their political mentors. The general conclusion is one of a "primacy of politics", a fragmentation of the corporate ideal, in which the lack of influence of the businessman, and especially of the manufacturer, in British politics and British society meant that the Edwardians' fear of protectionist vested interests was highly exaggerated. The cunning, grasping businessman of legend is found to be little more than fiction.